‘When creative development for the site began, we wanted to be sure to position the artist and his work in an appropriately finessed environment,’ says creative director Deborah Barnett. ‘We recognized the requirement to retain the strong traditional music audience already following Mr Goodyear’s career, and entice new classical music enthusiasts to become part of Stewart's fan base. With Aaron Benson at the web design helm, Someone created a CMS site that updates efficiently, allowing his site administrators to keep up with the rapidly accruing praise and accolades Stewart Goodyear garners with every performance. 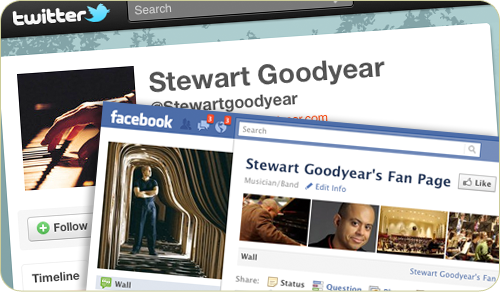 Stewart's appearances and new compositions, his life as a touring concert pianist, and his shared moments, playing with orchestras all over the world, are all accessible and immediate at stewartgoodyear.com. Face to face, Mr Goodyear has fine print calling cards in hand, designed by the Someone creative team to extend his minimalist brand identity. His cards are printed on luxury laid, duplex cover stock, white on front and black on back. The duplexed paper reinforces the precise contrasts of the piano keyboard, and the sophisticated positioning Stewart holds in the classical music industry. The letterpress calling cards will send press and media representatives, fellow musicians and fans to Stewart's site, where they can sign up for newsletters and get connected via social media. 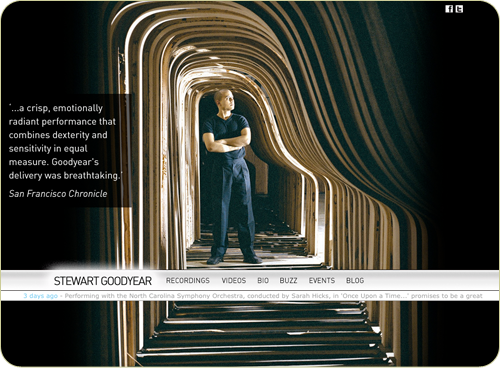 NB: If you're interested in the most vivid and powerful renditions of the greatest classical piano works of all time, go to Stewart Goodyear's site. Sign up for newsletters alerts, add a comment as a member of Goodyear's fan club and get connected at stewartgoodyear.com. You can also visit his facebook fan page and follow him on Twitter - Be at the ready to have his music move you!